The Democrats’ debate in Vegas on Tuesday was an interesting piece of TV. I’ve made my own feelings about the race known here. 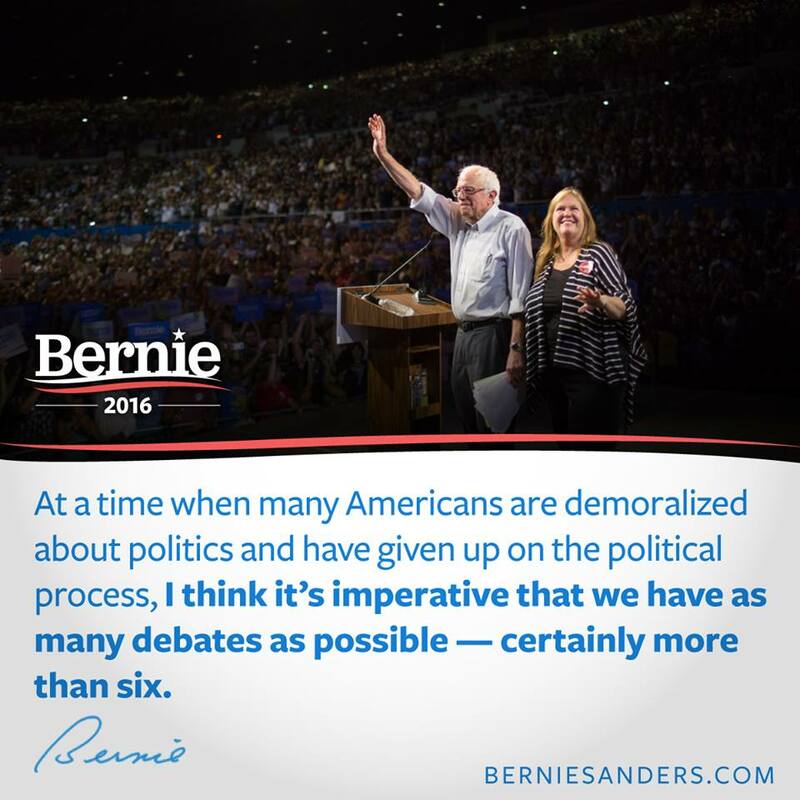 I’m energized by the presence of Bernie Sanders in the race, primarily because he’s saying things that no one else will say. And not to get too excited, but Bernie apparently won the polls for the candidates conducted during and after the evening. I don’t vouchsafe for the relevance of memes, but the numbers posted apparently check out. 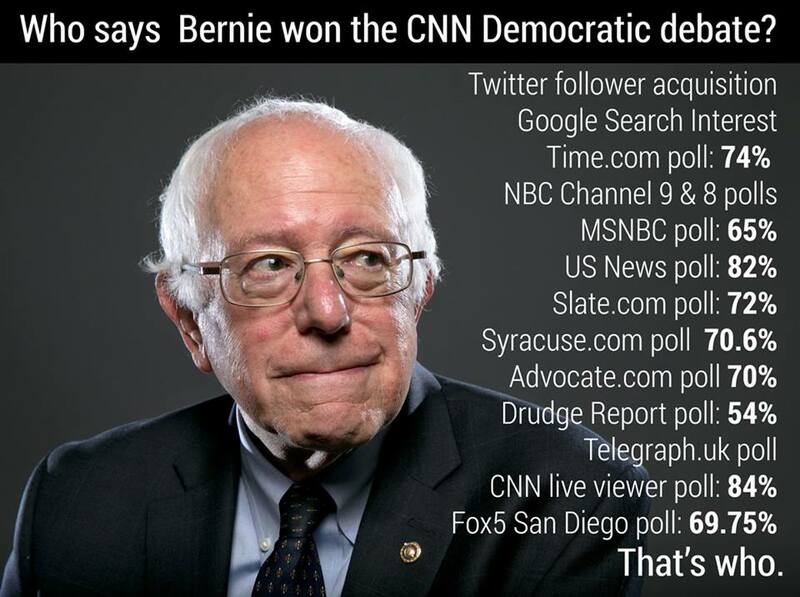 a collection of polling after the debate, lost by the folks at CNN. But regardless of the polling, most media outlets called the evening for Hillary. If this all seems unfair, it shouldn’t surprise anyone. 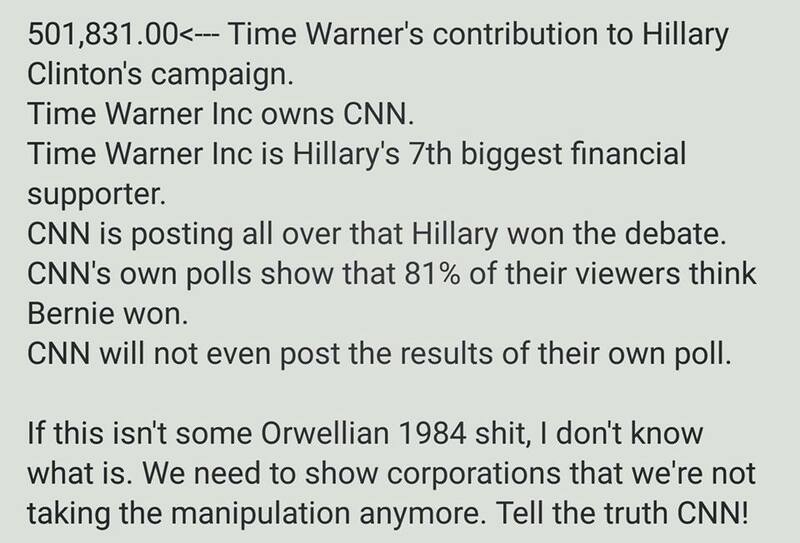 Another meme (which checks out) involves the WHY of CNN wanting to tip the scales toward Hillary. The donations list is at Open Secrets, and it covers Hillary’s political career, but it makes for interesting reading–Time Warner, Goldman Sachs, Citigroup and JP Morgan Chase have all dumped hundreds of thousands into Hillary’s campaigns. Does anybody besides me want to have CNN disclose that fact at the top of the debates? But all of the attempted gaming on the part of Hillary’s supporters may be for naught in any case. If you’ve been reading this space, you know that I’ve posted several articles about the reality that we’re on the way to another major recession. Lost in all the hoopla over the debates is the news from British Banking giant HSBC that we’re in a recession. Global trade is also declining at an alarming pace. According to the latest data available in June the year on year change is -8.4%. To find periods of equivalent declines we only really find recessionary periods. This is an interesting point. On one metric we are already in a recession. As can be seen in Chart 3 on the following page, global GDP expressed in US dollars is already negative to the tune of USD 1,37trn or -3.4%. That is, we are already in a dollar recession. Complete article (with links to mainstream sources) here. If we’re heading into a major recession, we’re in nearly as big a mess as we were in 2008. The Fed can’t lower interest rates below zero. And the ‘Freedom Caucus‘ (aka the teabagger contingent) will never go for increasing UI, offering aid to states, or increasing the national debt to try to stimulate the economy. Politically, we’re in worse shape than we were after the 2008 collapse of Lehman Brothers. 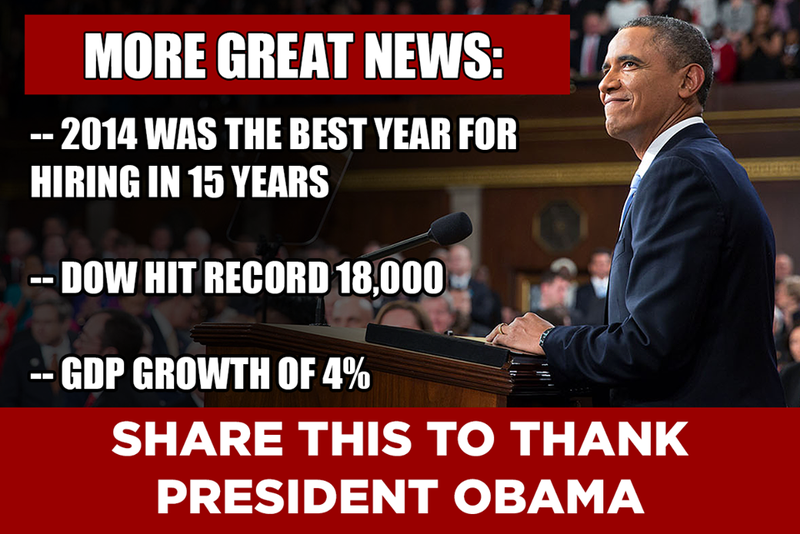 Many Democrats have been treating the economy as a win for Obama (and by extension Hillary). I posted this back in February, and it’s been the Dems’ talking point since forever (there are newer ones, but you get the idea). But the stock market lost over 2,000 points this summer before hitting in the 17K range (it’s 17,141 as I type this) and Wall Street is HOPING FOR MORE BAD NEWS–they want the Fed to keep ZIRP in place. The fact that a simple increase in interest rates could send the stock market reeling tells you what you need to know. The Fed’s free money is pretty much the only thing propping up the Dow. What if that’s not enough? What if we’re heading for a recession even if the Fed doesn’t raise interest rates? What does recession have to do with the Democrats’ debate? Historically, American voters hold the party in office responsible if the economy tanks. Simply put, the party with a guy in the White House doesn’t usually keep the office in an election that occurs during a recession. A recession would therefore probably doom Hillary (and Biden)–they’re both too close to Obama for people to give them the benefit of the doubt if the economy tanks. But Sanders is probably not perceived as an insider in the Democratic party. A Sanders presidency wouldn’t be perceived as a third term for Obama. I touched on this issue a month or so ago. The variable here is that whoever wins the DNC nomination will still have to go head to head with someone from the GOP clown car. But as I’ve pointed out before, the country already has a record number of unemployed adults. The last thing unemployed voters will want is a GOPer who wants to talk about ‘tough love’. Maybe the tide will turn Bernie’s way. Not that I’m expecting miracles, here. Even if Bernie’s elected, he probably can’t overcome the massive inertia that is both houses of Congress. He may well be the last president we’ll have. But don’t go by me. I’ve reached the Seventh Stage of Grief. Short version with nothing to read here. Donate what you can to Bernie’s campaign. He’s what we need.